Union Pool have announced more performers for this year’s free Summer Thunder series. New additions include Kid Congo Powers & Pink Monkey Birds and a reunion of shitgaze ragers K-Holes on July 25, and new Matador Records signee Steve Gunn will play Summer Thunder on August 29. There are some additions to already-announced shows as well. The May 30 kickoff show with Hector’s Pets will also feature sets from party punks Metalleg and Slam Section. The highly anticipated (by us at least) June 27 Destruction Unit show has now gotten better, with the addition of Pampers and Cheena. The June 13 Blues Control show now also has Hex Message (who’ve toured with Gang Gang Dance) and Ohal. And the Summer Thunder edition of JD Samson‘s PAT party now includes a live performance by “gender-problematizing goth dance band,” Bottoms. And unfortunately Endless Boogie has dropped off the June 6 Summer Thunder show, but gnawa group the Innove Gnawa Band are still playing, with more acts to be announced. 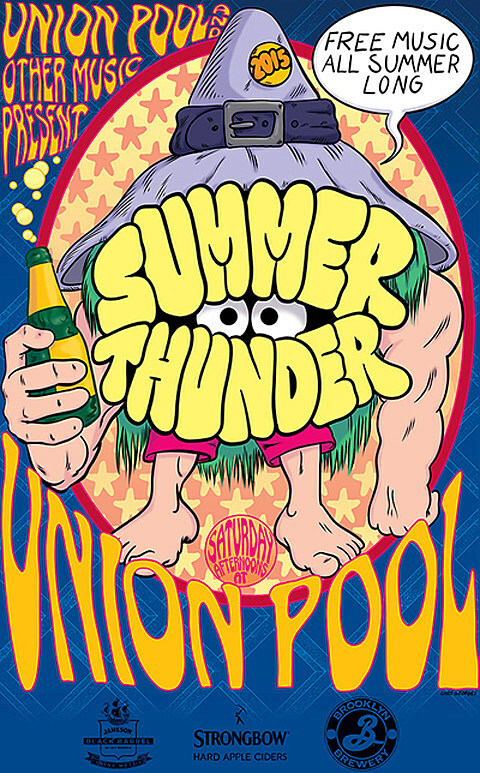 Summer Thunder happens Saturdays from May 30 through August 29 at Union Pool from 2 PM – 6 PM. Free, 21+. For more info and updates, check out Summer Thunder’s facebook.